*Corresponding author: Faisal Uddin M, Department of Internal Medicine, Owaisi Hospital and Research centre, Hyderabad, India. We present the case of a 52 year old male initially diagnosed with squamous cell carcinoma of the right main bronchus by endobronchial biopsy, who after undergoing a pneumonectomy the surgical biopsy was changed to high grade mucoepidermoid. His post-operative course was complicated by healthcare associated pneumonia and unmasking of symptoms of emphysema. Mucoepidermoid Carcinoma (MEC) is a salivary gland tumor that rarely presents in the lungs and can be sometimes misclassified as squamous cell carcinoma. While surgical resection is the initial treatment of choice, its tendency to present as a proximal endobronchial lesion requires many patients to undergo lobectomies or pneumonectomies. To the best of our knowledge, this is the only case of high grade MEC of the lung that was previously misdiagnosed as squamous cell carcinoma. A 52-year-old male smoker presented with complaints of chest pain and persistent cough to his PCP. He had lost 10 pounds over the previous few months. He denied any fever, nausea or vomiting. He worked as a mechanist, with significant history of smoking one pack per day for more than 35 years. He had never been diagnosed with COPD in the past and denied previous use of inhalers. He reported a significant family history of cancer including breast cancer in his mother and melanoma in father. He had no sinus symptoms and no known exposures to tuberculosis. The patient’s vitals were normal and oxygen saturation was 97% on room air. The remaining physical examination was normal. 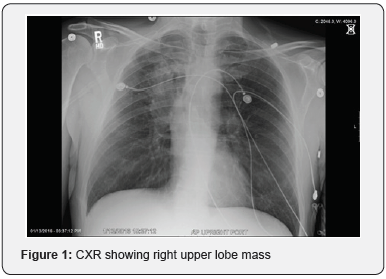 He underwent a Chest X-Ray (CXR) that was suspicious for a right upper lobe mass (Figure 1) which was subsequently confirmed by Computed Tomography (CT) scan of the chest. 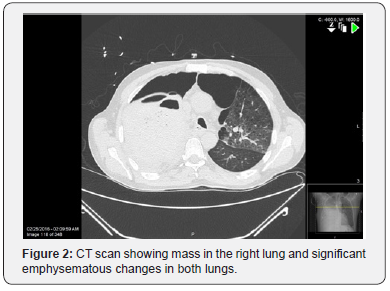 His imaging was also significant for bilateral emphysematous changes (Figure 2). His pulmonary function test before the surgery showed a forced vital capacity of 4.6 liters (90% predicted) and an FEV1 of 2.9 liters (79% predicted). FEV1/FVC ratio of 0.63 consistent with a mild obstructive ventilator defect. No significant change was seen in flow rates with administration of bronchodilator. The lung volumes and diffusion capacity were normal. Bronchoscopy was performed, which revealed an endobronchial lesion in the right main bronchus. Endobronchial biopsy was obtained. The histopathological examination revealed poorly differentiated squamous cell carcinoma. Immunohistochemical analysis was done which showed that the cells were CK 5/6, CK7 and p40 positive as well as CK20 and TTF1 negative. No mutation in EGFR was detected. Fluorescence in situ hybridization was negative for a rearrangement involving ALK gene and ROS1 gene. 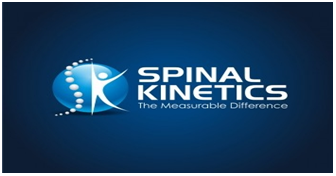 A PET scan and MRI showed no remote disease. The patient was referred to thoracic surgery, who performed a staging mediastinoscopy and then went on to perform a right sided pneumonectomy was done. The patient was referred to thoracic surgery, who performed a staging mediastinoscopy and then went on to perform a right sided pneumonectomy was done. His post-operative course was uneventful until the 5th postoperative day, when he developed hypoxic respiratory failure. 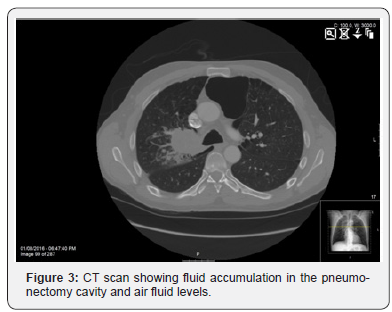 At that time, a CT scan showed fluid accumulation within the pneumonectomy cavity (Figure 3) and mild left retrocardiac atelectasis as well as an elevation of white blood cell count. He was started on broad-spectrum antibiotics for healthcare associated pneumonia. He underwent a bronchoscopy which revealed thin purulent secretions in the trachea, left main, left upper and lower lobes. Later that day, he was intubated due to increasing respiratory distress. BAL viral and bacterial cultures were negative and sputum culture grew normal flora. Leukocytosis would improve, and on the 11th post-operative day he was extubated. He continued to have wheezing with minimal exertion despite short acting bronchodilators 16 days after the surgery, and following this long acting bronchodilators were initiated (tiotropium and fluticasone/salmeterol and albuterol as needed) with recommendations from the pulmonary consult team to get outpatient pulmonary function testing. He was discharged on home O2 on post-operative day 20. 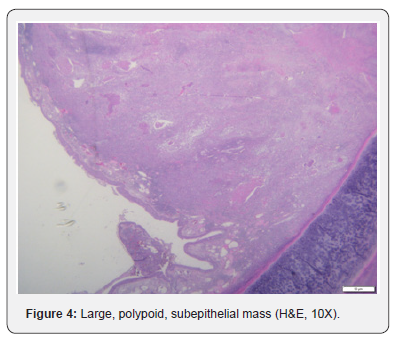 The histopathology report on the post pneumonectomy specimen showed findings consistent with the diagnosis of high grade MEC (Figure 4-6), and one node was positive from the mediastinoscopy. The patient was subsequently presented at tumor board and diagnosed with Stage 3A (T3N1M0) mucoepidermoid carcinoma. Adjuvant chemotherapy was recommended as an outpatient. Mucoepidermoid carcinoma of the lung is a rare presentation of the most common salivary gland tumor. It is associated with smoking and can be classified as either low grade or high grade. MEC in the trachea bronchial tree is rare, accounting for only 0.1%–0.2% of all pulmonary malignancies [3,4] and is thought to arise from the minor salivary glands in the trachea bronchial tree . 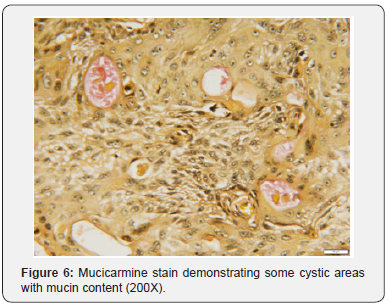 This tumor is classified as either low grade or high grade on the basis of histologic criteria . Low-grade MEC shows minimal or no mitoses, nuclear pleomorphism, or necrosis within the tumor . High-grade tumors show increased mitoses (more than four per 10 high-power fields), nuclear pleomorphism, hyperchromasia, and cellular necrosis [4,6,7]. The diagnosis of MEC can be difficult pathologically based on several important features. It is a subepithelial tumor which arises from the bronchial submucosal glands. Low grade tumors show mucus filled cystic areas as well solid areas. The cysts or glands are lined by columnar cells and low cuboidal cells with mild cytologic atypia, with small, round, basally located nuclei. Mitotic figures are rare in low grade tumors, as is necrosis. The solid areas are mainly composed of epidermoid and intermediate cells with minimal cytological atypia. 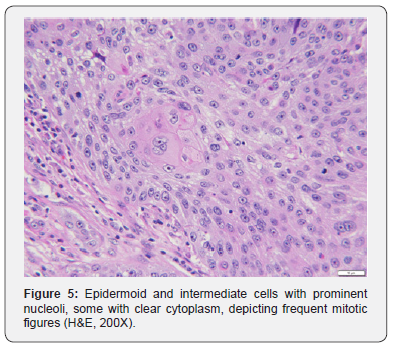 Epidermoid cells have features of nonkeratinizing squamous cells with eosinophilic cytoplasm. Intermediate cells may have nuclear clearing. High-grade mucoepidermoid carcinomas, like our case, show a predominance of solid areas composed of intermingled epidermoid and intermediate cells with a lesser representation of mucin secreting cells. Tumor cells demonstrate nuclear atypia, hyperchromasia and pleomorphism, as well as higher mitotic counts. Necrosis and perineural invasion may be observed. The most problematic differential diagnosis of mucoepidermoid carcinoma in the lung is adenosquamous carcinoma. In general, mucoepidermoid carcinomas are centrally located with an endobronchial growth pattern and are relatively common to recognize areas of low grade mucoepidermoid carcinoma in association with the high grade areas which pose difficulties in diagnosis. In addition, prominent keratinisation, and in situ carcinoma on the surface of the bronchial epithelium, which can be present in adenosquamous carcinomas, is not seen in mucoepidermoid carcinomas of the lung. Several cytokeratins, including AE1, CK7, CK5/6, CK7 and CK8, as well as PCNA, Ki-67, p63, p53, CD10 and p27, are common markers that are used to identify MEC . In our case, histological staining was performed for CK7 (+), CK5/6 (+), p53 (+), CK 20 (-) and TTF 20 (-). CK5/6 is also positive in 90% of squamous cell carcinoma and at least 20% are found to be CK7 positive . Because of considerable overlapping between the markers used to identify MEC and SCC, immune phenotyping should not be used alone for histopathologic classification of lung cancer, but only as an adjunct to light microscopy. Surgery is the standard treatment for medically operable patients with clinical stage I and II non small cell lung cancer, in whom there is no evidence of mediastinal involvement prior to surgical resection . In our patient, right pneumonectomy was done by a standard posterolateral thoracotomy. Radical surgery based on lung cancer treatment is also performed for MEC . MECs of the lung are often treated by lobectomy, sleeve resection, local resection, segmental resection, or even endoscopic removal. Treatment would not have been different pre-operatively even if MEC was correctly diagnosed (Figure 7). However, postoperative course may vary in patients with high grade MEC which is why it is important for post-surgical specimens to be sent for pathology in addition to bronchoscopy specimens. Effective treatment for high-grade tumors has not been established. There are no randomized controlled trials studying the profit of adjuvant chemotherapy in MECs of the lung and given the rarity of these tumors, such studies will likely never be designated . Due to its often proximal endobronchial location, patients like ours who previously had good pulmonary function despite parenchymal evidence of emphysema may have unmasking of COPD symptoms once undergoing a lobectomy or pneumonectomy due to their limited reserve. John A Howington, Matthew G Blum, Chang AC, Balekian AA, Murthy SC (2013) Treatment of Stage I and II Non-small Cell Lung Cancer: Diagnosis and Management of Lung Cancer. Chest 143(5_Suppl): e278S-e313S. 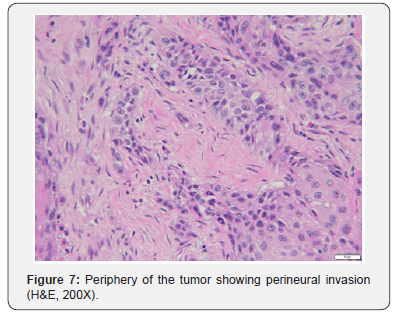 Cheng Shen, Guowei Che (2014) Clinicopathological analysis of pulmonary mucoepidermoid carcinoma. World J Surg Oncol 12: 33. Miller DL, Allen MS (1993) Rare pulmonary neoplasms. Mayo Clin Proc 68(5): 492-498. Kim TS, Lee KS, Han J, Im JG, Seo JB, et al. (1999) Mucoepidermoid carcinoma of the tracheobronchial tree: radiographic and CT findings in 12 patients. Radiology 212(3): 643-648. Ishizumi T, Tateishi U, Watanabe S, Maeda T, Arai Y (2007) F-18 FDG PET/CT imaging of low-grade mucoepidermoid carcinoma of the bronchus. Ann Nucl Med 21(5): 299-302. Yousem SA, Hochholzer L (1987) Mucoepidermoid tumors of the lung. Cancer 60: 1346-1352. Lukomsky G, Tetarchenko V (1979) Bronchology. St Louis, Mo: Elsevier Mosby 287-305. Qian X, Sun Z, Pan W, Ye Q, Tang J, et al. (2013) Childhood bronchial mucoepidermoid tumors: A case report and literature review. Oncol Lett 6(5): 1409-1412. Kim MJ, Shin HC, Shin KC, Ro JY (2013) Best immunohistochemical panel in distinguishing adenocarcinoma from squamous cell carcinoma of lung: tissue microarray assay in resected lung cancer specimens. Ann Diagn Pathol 17(1): 85-90. Kuzucuoglu M, Karamustafaoglu YA, Cicin, Yoruk Y (2014) A rarely seen mucoepidermoid carcinoma of the left main bronchus. J Can Res Ther 10(2): 384-386.